Geneva, December 3, 2018 - STMicroelectronics (NYSE: STM), a global semiconductor leader serving customers across the spectrum of electronics applications, has unveiled two new automotive global shutter image sensors, the VG5661 and VG5761, featured for driver monitoring. Both were demonstrated with automotive software innovator Jungo's driver-monitoring solution CoDriver, at the recent AutoSens Imaging conference and at Electronica 2018. These advanced image sensors enhance monitoring of vehicle occupants by capturing the scene as illuminated from the camera, eliminating unpredictable external effects such as sunlight or street lighting. Their superior image quality sharpens the responses of driver-monitoring systems, especially under near-infrared illumination close to 940nm, and makes possible new features, such as assessing driver attention, passenger comfort or child behavior. The new sensors embed ST's automotive global shutter technology that strongly minimizes the illumination power consumption, even in high dynamic range mode. Safety organizations worldwide agree that driver fatigue is a factor involved in up to 25% of road accidents. Enhanced driver monitoring using ST's image sensors can reduce injuries and save lives. The sensing accuracy also helps autonomous-driving systems assess a human driver's fitness to take over any time during a journey, easing transitions between manual and autonomous driving modes for greater comfort and safety. The European car safety rating system Euro NCAP's 2025 Roadmap has proposed driver monitoring as the highest priority primary-safety feature. It is also a prerequisite for automated driving. Working with Jungo, ST recently showed how the new sensors enable next-generation driver assistance at international industry events. Jungo's driver-monitoring software leverages the crisp, clear images from ST's sensors to monitor the position and movements of all occupants, assessing the driver's condition and accurately surveying the location and movements of other vehicle occupants. The demonstration highlighted opportunities to improve interactions between autonomous and human drivers and showed how passenger monitoring expands opportunities to enhance comfort and security. 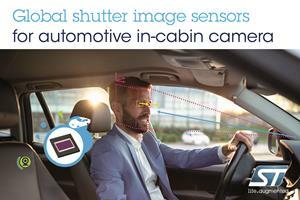 "Featuring ST innovative automotive global shutter technology, our image sensors are designed to enhance the performance of advanced automotive and industrial machine-vision applications," said Aymeric Fuchet, Differentiated Imaging Solutions Business Line Director, STMicroelectronics. "Our successful cooperation with Jungo has shown how these sensors can enhance road safety and extend the performance of autonomous driving systems." Ophir Herbst, CEO of Jungo added, "Our software-based solution, combined with the outstanding background-removal and moving-image capture capabilities of ST's sensors, enables affordable, high-performance driver monitoring and creates a powerful, flexible platform for new features and services in the vehicles of the future." The sensors are currently sampling, and ST is working with lead customers to facilitate adoption in new driver-assistance systems for next generations of vehicles. ST's VG5661 and VG5761 are 1.6Mpixel and 2.3Mpixel automotive global shutter sensors. Unlike the rolling shutter which continuously reads data directly from pixels one row at a time, global shutter captures the data at all pixels simultaneously. ST has created a unique automotive global shutter pixel with two memory cells while keeping a small pixel size of 3.2um, resulting in compact sensors, and higher resolution that capture sharp, crisp images in challenging conditions. Two memory zones allow double-image storage, enabling linear high dynamic range up to 98dB or background removal without lag effects and with no need for additional processing by the host system. This offloads the host processor and reduces instances of correction artefacts. In addition, high dynamic range and high MTF (Modulation Transfer Function) at near-infrared wavelengths further minimizes interference from natural light sources. The VG5661 and VG5761 are supplied in standard BGA packages, or as bare die for direct integration in automotive OEM systems produced in high volumes. They are qualified to AEC-Q100 grade 2 and include complex safety-integrity features as required for an ASIL-B camera system in accordance with the automotive safety standard ISO 26262. Please contact your ST sales office for pricing options and sample requests. In 2017, the Company's net revenues were $8.35 billion, serving more than 100,000 customers worldwide. Further information can be found at www.st.com.